The Globe Theatre, who are currently touring the UK before their main season launches in early June on Bankside, have brought Shakespeare's Henry V to the Liverpool Playhouse. Framed by its famous proscenium arch the unfolding of England's victory over France at the battle of Agincourt under the direction of Dominic Dromgoole was a pleasure to witness indeed. If the words Shakespeare, Henry V and battle evoke thoughts of a heavy, relentless, tiresome history lesson in a dimly lit classroom, banish them immediately! You are in danger or discolouring what is an extremely vibrant and exciting production. 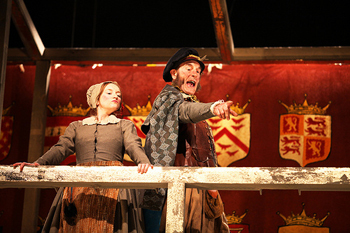 It was delivered by the Globe's acclaimed entourage of actors and actresses including the flawless performance of Jamie Parker as Henry V (returning after playing the role of Henry IV some two years ago) in what felt like true Shakespearian style; articulate, assertive and with a pinch of devilment. Every member of the cast whether playing one or numerous roles brought complex and strong characters to the stage. The play itself throws up numerous questions about the morality of war and virtue of historical figures, which scholars and writers muse over repeatedly. Whether it holds a particular view of Shakespeare or leans in interpretation thereafter, one cannot escape the questions of duty, responsibility and fairness as well as exploring the more individual nature of courage, cowardice, love and comradeship. Much has been written about whether it has anti-war or pro-war sympathies; whether it depicts a patriotic or critical view of historical events, but to fully appreciate the play in all its complexity this distinction may be one that detracts rather than enhances. It is how it is received, which has changed through time, that matters. And it was received very well at the Playhouse! With the theatre remaining softly lit in almost natural light, the aisles and entrances of the Playhouse were utilised as routes for soldiers' advances during battle and cowards' retreats afterwards, courtiers choral processions and the arrival of messages, pleas & declarations to the King. This strategic use of lighting, space and movement provided a sense of expansion within its walls - both upward and outward, bringing the feeling and illusion of an open air cylindrical theatre into an indoor setting. The walls of the theatre almost disappear as the audience is transported from coast to coast, chambers to battlefield against the beautiful wooden fortress that stands strong and unmoveable on centre stage. Feelings of anticipation and surprise are elevated precisely because the audience is encompassed within the heart of the drama; when the rumble of war drums can be heard emerging from behind and the voices of song begin, one is pulled with them in their increasing volume onto the stage and into battle. The colourful tone of the play is set from the first scene through the wonderful costumes and direction. The Archbishop and Bishop of Ely open in conversation concerning the nature of the King's character, the gravity of the church's offerings upon his decision to go to war, future riches and land rights whilst both of them in turn lift their garments and use the toilet! 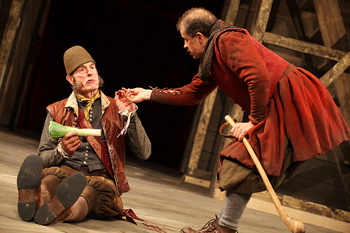 Throughout the performance the subtle and often dry comedy remains, especially within the accents and stereotypical behaviours of the English royalty and commoner, Irish, Scottish, Welsh and French - whereby the humour woven into the structure of the play is carefully brought to the fore through its excellent direction and performance. Pistol (Sam Cox), Baroolph (Paul Rider) and Nym (David Hargreeves) in their underhanded comedic trio join the King on his journey and provide an interesting comparison to his noble and virtuous motivations and endeavours with their pilfering and hubristic ways. The major act of what is deemed 'wrong' in today’s world of Just War Theory and human rights is that Henry orders the execution of the prisoners and captured men of the French army despite ensuring the safety of its ordinary citizens once the battle is won. This in light of wars after the middle ages is seen as callous and unjust but at the time of the play and before the agreed terms of war by which nations are supposed to adhere to today, it is a source of contention as to whether, or to what degree, morals of a new era can be applied to an older one retrospectively. For me in order to get the most from this play I think it is important to view it in the context of being one which highlights the complexity within shifting dynamics in times of peace and war. And in addition, whilst it provided entertainment and distraction for the Elizabethan audiences who watched it in the middle ages, Henry V was staged at a time when the Earl of Essex's campaign was underway in Ireland. At this moment in history, with the inevitability and brutality of war it carries with it, in Henry's actions, a sense of integrity and virtue which could be argued as needed by the people likely to be called for duty at this time. That said, the choreography of battle scenes and emphasis on the use of the English longbow and hand to hand combat is breathtaking. Through the smoke and slow motion enactment upon the battle ground, the audience is literally transported to the front line. The make up, blood, gore and elaborate costumes of the French and tatty clothes of the English are phenomenal. The Chorus (Brid Brennan) throughout explains, apologises, focuses & clarifies the order of things within the play, and is only once acknowledged as such in the closing act when Fluellen (Brendan O'Hea) in all his enthusiastic importance ushers her off stage so he can command it himself with comic subtlety and panache. For those less familiar with a Shakespeare play, these interludes are a wonderful and necessary means of seeing the whole, and contextualising the parts, in a guided meditative way. Imagine if you will, becoming part of a world in which poetry is the language - it may seem a little odd to begin with but after a time your brain adjusts to the rhythm and pace through which words are delivered, and it's only when you come to order ice cream you realise you're talking to the usher with a new tongue. For the well versed or the less familiar you are guaranteed a fantastic evening, see it before it leaves the North West – I'd definitely go again to watch it a second time! Henry V is playing until Saturday 28th April.